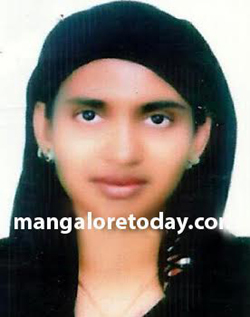 Mangaluru, Jun 15, 2015: A 22 Year old woman from Makki in Moodbidri went missing after she left home to bring ration items. As per the complaint lodged by her Sister at Moodbidri police station, Zohra did not return home after she stepped out of the house on Friday. Zohra who lives with her husband in abroad had recently arrived to her native place. Her husband belongs to Banlegudde in Karkala. It is learnt that Zohra had pledged her golden ring in a local bank at Shirtady and borrowed a loan of Rs.2400 against it before she went missing. A case has been registered at Moodbidri Police station, the investigating has begun.